t*rexes and tiaras: Stripes and Dots.. I did something a little silly last week and managed to drop a weight on my foot whilst in the gym. It's pretty swollen up and the bruise has been working it's way through a rainbow of colours. It's a lot better than it was, but still hurts a bit to wear heels, so today I decided to give these ICED pumps an outing. I'd forgotten about this dress until I was moving some things around in my Wardrobe Room at the weekend. 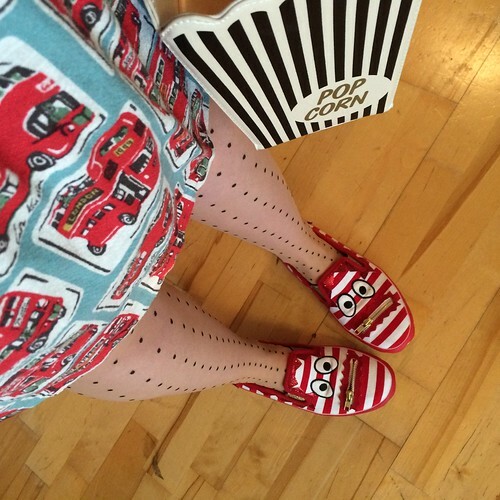 I figured it was the perfect opportunity to wear it, and matched striped shoes with striped popcorn bag, adding the dotty tights for a little added interest. How do you dress for comfort? 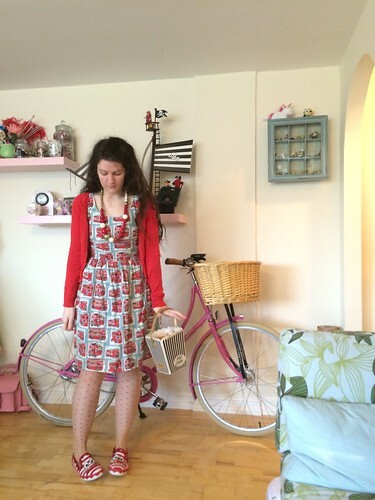 It's such a cute dress, I can't believe I'd forgotten I had it.. I wish I'd bought the dress sometimes! It's pretty cute, I think I'll keep it for now. My 3 year old nephew landed on my foot at the weekend, full body slam from a height! He's tiny, but even his little skinny bones weigh enough to hurt! I can't see a bruise yet, which I'm surprised about. Anyway hope your foot heals soon, love that dress. Ouch- hope your foot is OK! Thanks, it's a lot better now than it was, I'm pretty lucky it was just a bruise, I think. Ouch!! Hope nothing's broken and that the swelling goes down soon. On the upside, your outfit looks awesome. 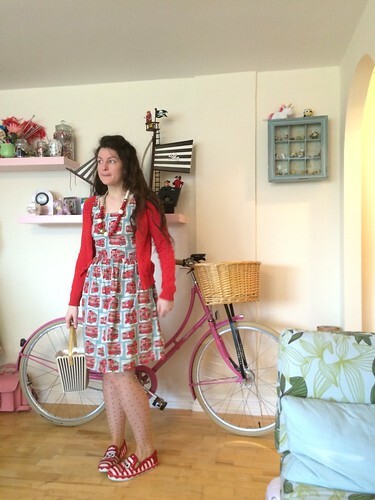 Love the polka dot tights with the bus print dress. It's all OK now, just a yellowish bruise which is almost gone, so I think it was just bruised. Phew. Love this outfit but hope your foot feels better soon! Thank you - it's much better now! my dress for comfort is a lot less glamorous than this - jeans, huge jumper, slipper boots and probably a scarf!